To learn how to make slime you have to start with the right slime ingredients. Even the best recipe won’t work if you don’t use the right slime supplies. Ingredients for making slime are easy to find if you know what you are looking for! Stock your pantry for afternoons filled with slime making. Here’s our list of recommended slime supplies. HAVE YOU MADE SLIME YET? Has your kid asked you to make slime yet? Would slime making be an awesome science demonstration for your class? Looking to do something totally cool like homemade slime for camp with the kids? Are you confused by which slime ingredients you need to buy? If you answered yes to any of these questions, then you just have to try making slime. If you are a slime master, maybe you will find some new fun mix-ins! It’s not enough to know how to make homemade slime, you need to have the right stuff! That’s precisely why I have put together an easy list (free printable included see the bottom of post) of our recommended slime making supplies. 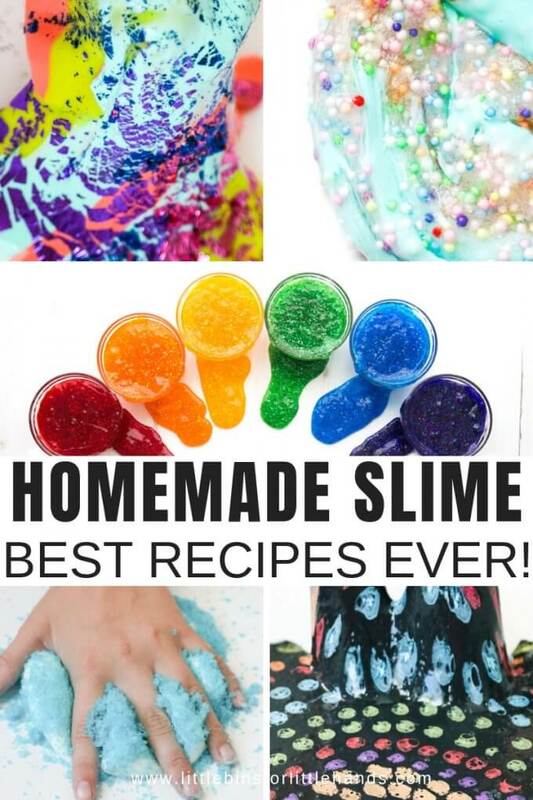 We have about a dozen must try slime recipes that have lots of cool variations you can try and some do need an extra special ingredient beyond the basic ingredients. Stock your pantry and never have a dull moment with the kiddos! Click on the pictures below to check out these items on Amazon. These are affiliate links for your convenience. I receive a small percentage of any items purchased through Amazon which helps support this site! I am not compensated by the brands themselves (like Elmer’s), we just like using them! NOTE: Not listed below is our favorite saline solution. We order ours from Target, Up and Up brand for sensitive eyes. Our grocery store also stocks Lin-it brand liquid starch, so we use that one. 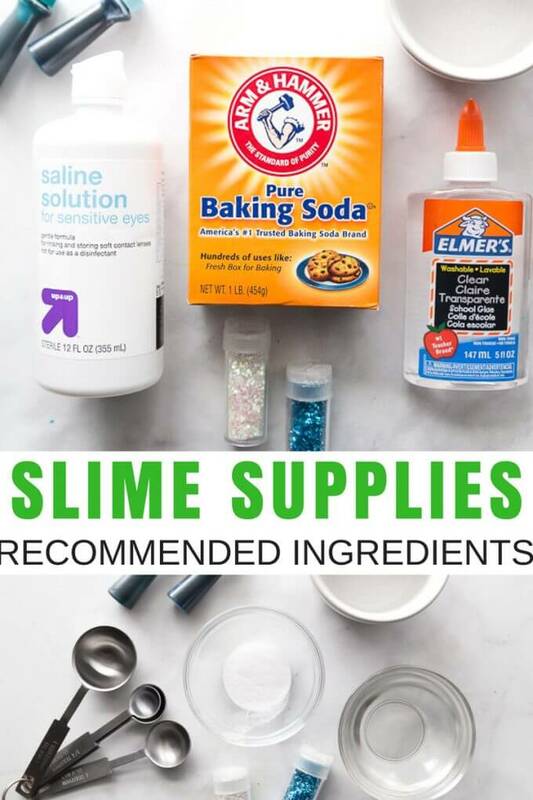 Use the following supplies to make our 5 BASIC SLIME RECIPES quickly and easily. Once you master the basics, you will be able to design 100’s of creative slime ideas. We cannot guarantee results from products we don’t use. If you do not have access to this type of glue, look for a PVA washable school glue or a glue specifically made for slime. The three main slime activators are borax powder, liquid starch, and saline solution/baking soda. You can read more here about these slime activators . The items below are so of the basics we like to keep on hand for making homemade slime. Food coloring, glitter, and confetti are staples in our slime lab. Our unique slimes use an extra special ingredient for a really cool texture or slime activity. Check out a few links to the exact recipes below, so you can see how we use these ingredients. Not only does slime last quite a while if stored properly. Not only does slime last quite a while if stored properly, but it’s also a great party activity or party favor. Check out our DIY slime making kit! INGREDIENTS FOR SLIME MAKE A GREAT SLIME KIT! 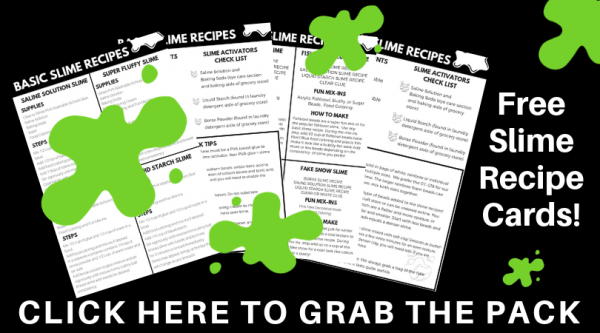 Make sure to check out our 5 Basic Slime Recipes to Get You Started. Grab a handy container and fill it with all the essential slime ingredients! Now you will be able to make cool slime recipes any day you want! Make sure to start off your slime making journey with the best recommended supplies for making slime, and you are one step closer to making the best slime every time. Plus we are always available for questions and will answer them as best as possible. BEST RECOMMENDED SUPPLIES FOR MAKING HOMEMADE SLIME RECIPES! This is not OK! IT DIDNT WORK! I am so NOT HAPPY. I buyed all the ingredients and it didn’t work!it made my kitchen A mess! This all your or whoever’s FAULT! NO it is not a substitute. Would you mind adding the recommended salt-to-water ratio for the saline solution? I don’t see that here. Obviously I could just make that up, but if you’ve had success with a particular ratio, I’d love to hear it. Thanks for all you do! This site was exactly what I had in mind when I was thinking of experimenting with different slime recipes. You can not use a salt water saline solution for making slime! You need a saline solution that contains sodium borate and boric acid which are the main slime activators! Thanks for thinking of us and feel free to email [email protected] with any specific questions as I can answer them faster! In South Africa we dont get liquid startch. Does that mean I have to stick to one of the other recipes? Probably if it’s not available to you unless you can order it and have it shipped to you. I spent %990 on supplies and followed all direction to the T and no slime was made very upsetting for me and my kids! I welcome emails to [email protected] plus you can also check out my live videos on Facebook and watch me make the slime using these ingredients. You might just need some trouble shooting with someone!